Achieve Happiness in Intimate Relationships? Even with the strongest motivation to make the ideal of love a reality, men and women have always had the greatest difficultly in bringing such desire to fulfilment in a world that does not understand deep feeling, dominated as it is by the tenets of materialism. Consequently, intimate companionship, as a unique, mutually reinforcing partnership that develops within a particular social and economic context, must be carefully considered from various perspectives. Indeed, even in the happiest marriage, the couple do not live on an island, but are affected by the events that unfold around them. The expression of "love" is more than simply two people occupying the same residence, for they must deal with mundane issues, such as income and employment, as well as bills and expenses. 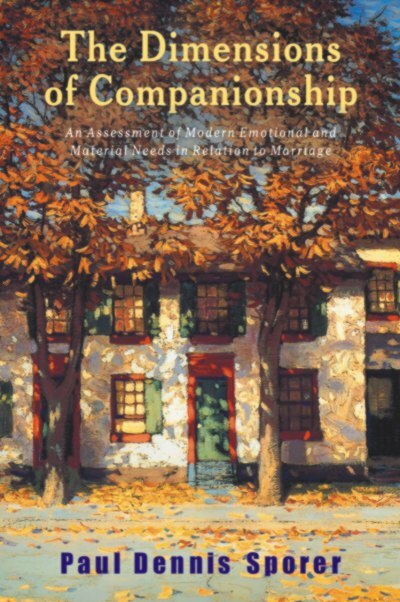 In The Dimensions of Companionship, Paul Dennis Sporer examines the realities of marriage in the contemporary world, where the individual attempts to reconcile complex emotional desires with numerous material demands. Various factors can lead to delaying or denying the experience of beneficial companionship. The men and women of our time undoubtedly utilize much of their intellectual and emotional energy for the purpose of increasing their income and career status. Sporer concludes that, despite this materialistic emphasis, the ultimate goal for all individuals is to develop and maintain a companionate relationship that delivers respect and consideration, in congruence with the requirements of a modern industrial social environment. The Dimensions of Companionship puts forward the idea that any intelligent and resourceful man or woman can bring their ideal of love into reality, by understanding the way in which the material demands of life integrate with individual motivations. Paul Dennis Sporer is the author of several books, including Liberating Love; Equal but Different; and The Concept of Family. He has also edited more than 30 culturally and historically significant books, including Painting Explained, by Thomas Gullick; Is Secession Treason?, by Albert Bledsoe; The French at Home, by Albert Rhodes; From Slave Cabin to Pulpit, by Peter Randolph; Newer Ideals of Peace, by Jane Addams; Views of Old Europe, by Bayard Taylor; Gentle Measures, by Jacob Abbott; The New Birth, by Austin Phelps; The Missionary, by Samuel Mazzuchelli; and Born Three Times, by Thomas L. Johnson.